I was given this small Hitachi hard drive that I just had to photograph and share. Here it is next to a standard sized 2.5 inch drive. Amazingly it is almost half the size of the full sized drive, and yet has 4 times the capacity. 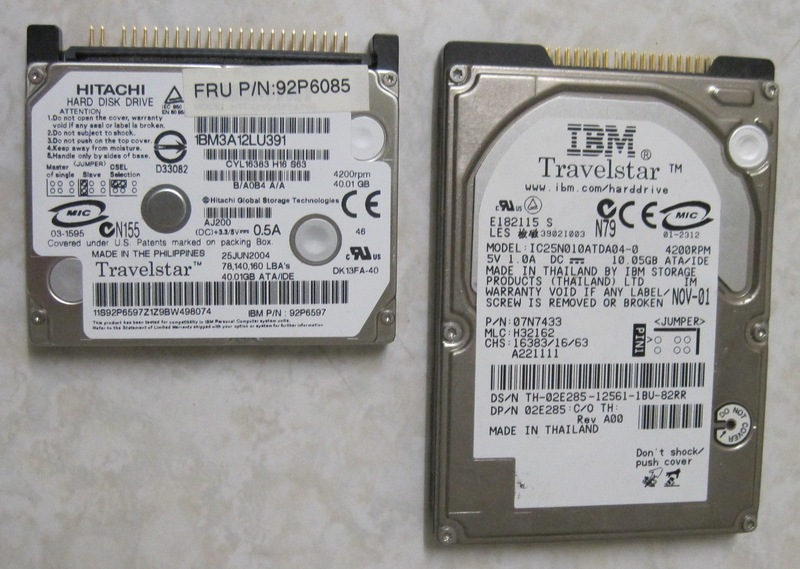 The drive was made in June 2004 and has the Travelstar name printed on it, indicating that this was likely an IBM model. Hitachi and IBMs hard drive division had merged in 2003, IBMs Travelstar and Deskstar series drives became a part of the Hitachi line. Even after the merger IBM continued to use the now Hitachi parts, this particular example came out of an IBM Thinkpad. Unlike the IBM Deskstar, Hitachi drives have mostly had a pretty good reputation. 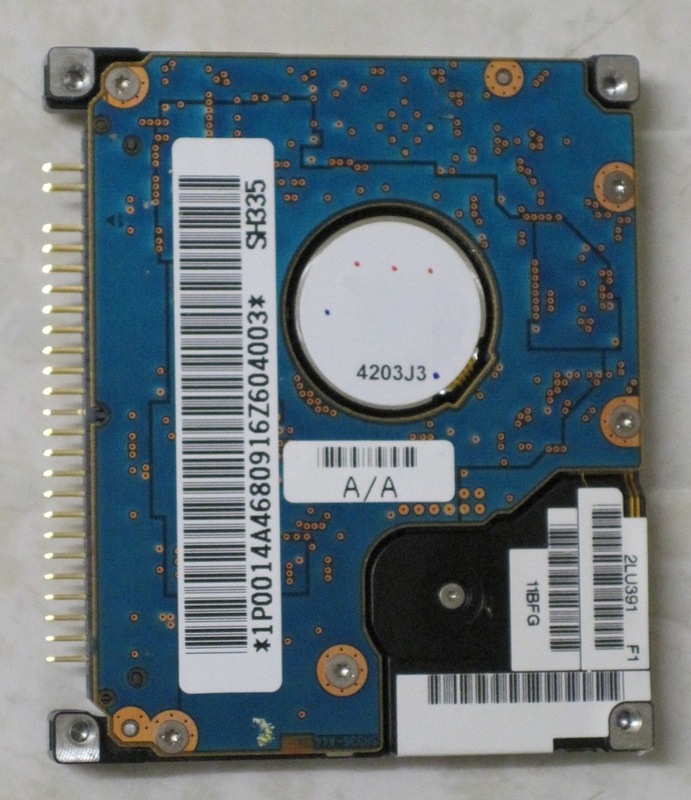 I only every saw mostly 2.5 inch drives in the wild, usually in laptops. A few weeks ago I had a Sun type 5c keyboard and mouse donated to me by a co-worker. It is significant because it will allow me to convert my Sparcstation 20 into a desktop workstation. I have a sbus frame buffer card on order and just need to get a 13w3 to VGA converter to complete the machine. I had previously been using it as a server for VPN, HTTP and SVN duties. Before 1990 the platform game genre existed almost exclusively on game consoles like the NES. 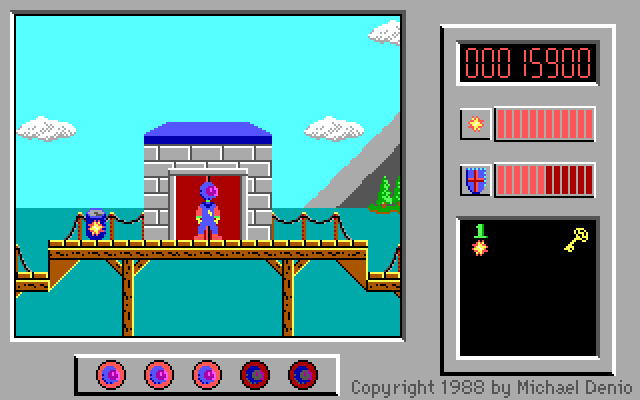 It was thought that the PC didn’t have the capability to produce scrolling graphics quickly. This of course is debatable as the technology existed much earlier in the form of the 286 processor, EGA and VGA graphics cards. I’d argue that it could have been possible by around 1985-7, as the 286 had become more powerful, and the graphics cards of the time had the capability. 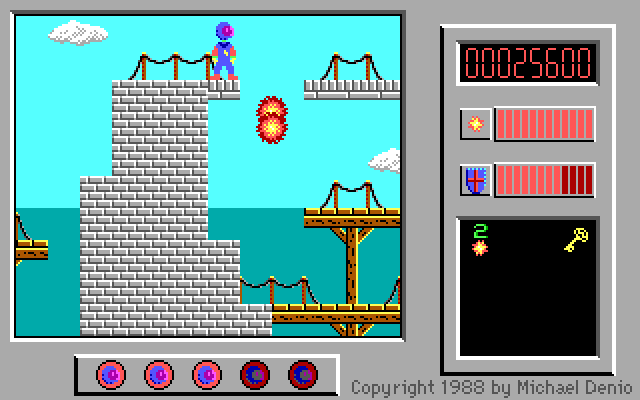 Today’s game, Captain Comic, was released in 1988, two years before Commander Keen and the rise of the platform game on the PC. It was created by an individual, Michael A. Denio and was self published under the shareware model. 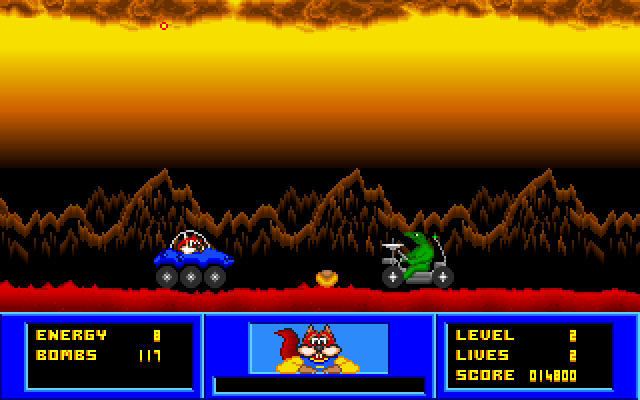 It has historical significance as the first side-scrolling platform game on the PC. 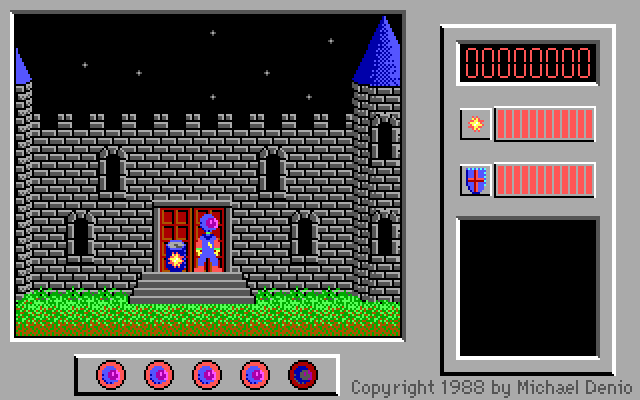 The game uses EGA graphics, which I think are designed well. The sprites are colourful, easy to identify, and animate nicely. The levels have unique backgrounds which give the context for the levels and are quite attractive. I thought the author had done quite a nice job with the pixel art in general. Although playable and quite an achievement at the time, the engine doesn’t seem capable of either smooth scrolling or a higher frame rate. This is hardly surprising, smooth scrolling on EGA requires specialised knowledge of the cards registers and memory map and using them cleverly to reduce the drawing load on the card. Impressively there is absolutely no flicker, which was a common problem on consoles and many old PC games. I’m guessing he used EGA page flipping or a double buffer to achieve this. The game supports PC speaker sound, which is fairly basic and is ok for what it is. The Adlib came out the same year, and as the game was made by one guy it’s understandable he didn’t include support for it. There weren’t any other sound devices he could have used. I used the keyboard controls for playing and found they were pretty good. The only problem being that you can end up moving about half a tile more than you thought depending on when you released the key. I suspect this is because of the games lower frame rate, you could release the key during the screen redraw, but after you’ve actually moved. Otherwise the controls for movement and jumping are accurate and responsive. The game itself is fun and challenging, and it isn’t overly punishing of mistakes. Enemies can hit you 7 times before you die, and they are destroyed when they make contact with you. Every Screen edge and door is effectively a check point as you return to the last one used when you die. The only thing that does punish you really is running out of lives, although you get extra lives if you pick up a shield when at full health or for every 50,000 points. 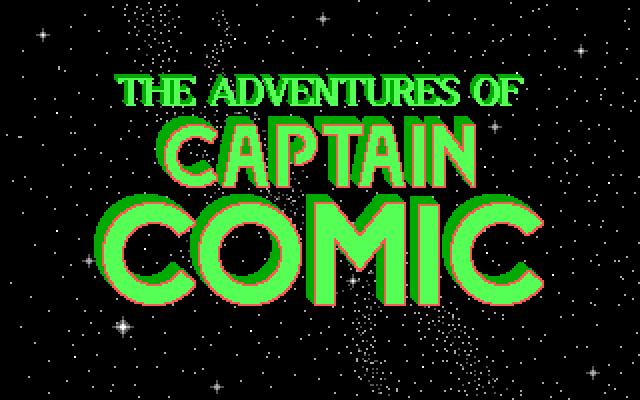 I didn’t get as far as I would have liked, but I found Captain Comic a charming, fun and challenging game. I didn’t get frustrated with it when I died, because it was usually my own fault. Each time I started again I got a little better, and a little further in. 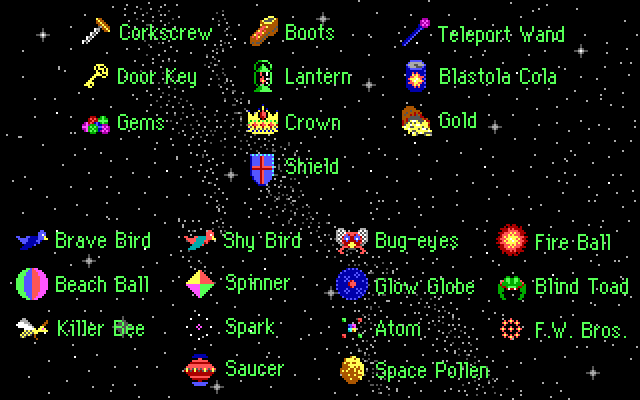 I even managed to find some of the items such as the cork screw and gems. Unfortunately it wasn’t a commercial success when it was released, but it seems to be fondly remembered by others on the internet. I’m rather impressed with what was achieved by a single guy. Whilst not smooth scrolling, the graphics are technically impressive, the game play is solid and the levels are challenging and fun. If you have a chance and like old DOS games give it a go. I’ve been using my old SparcStation 20 for about 3 years for storing my source repositories, allowing VPN access and web serving among other functions. I originally set it up like this as an interesting project to see if I could make good use of exceptionally old hardware with more modern software (NetBSD in this case) and it turned out to be quite handy. The experience as a whole has been a very positive one. Now the time has come to not so much retire the SparcStation, but move it into a new function as a vintage workstation. I was very fortunate to receive a donation of a type 5c keyboard and mouse suitable for use with it, all I have to get is a frame buffer card and I can plug in a screen and use it as a desktop. Fortunately frame buffer cards are much easier to find than keyboard/mouse combinations so I shouldn’t have an issue finding one. Having decided to build a new server machine, I went looking through my collection of old hardware to see what I could build out of my spare parts. I already had the large tower case recently donated, so I checked out what was installed in it. Turns out it was a Duron 800, which is quite reasonable, but after measuring its power consumption (about 70W without hard drives) I decided I could make a machine that was cheaper to run with some other parts. Obviously I want something more efficient than the SparcStation, which uses around 130W with everything installed. It turned out to be quite difficult to find x86 hardware that is efficient once everything is installed. After looking at what I have and doing a bit of research I decided to try out the old Coppermine Celeron 800Mhz as it had quite a low TDP. Powered up with a graphic card but no hard disks it used about 60W, unfortunately it didn’t want to boot, and no amount of prodding got it to work. Looking in my collection of old hardware I didn’t have many alternatives. I could use a socket 7 based system, but that would likely be _slower_ than the sparc and may use a similar amount of power. I have some Pentium II boards, but I wanted them as spares for my Win98 system. 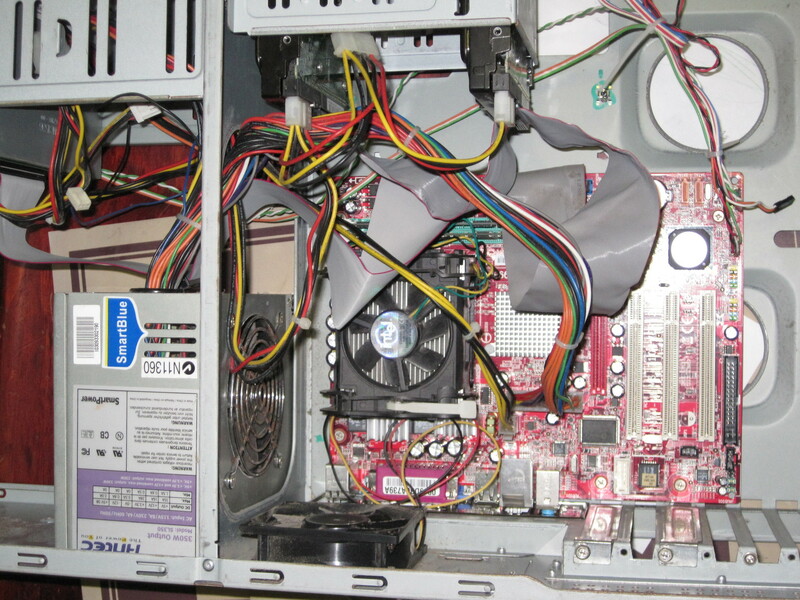 In the end I used some suitable socket 478 (Pentium 4) hardware, which initially looked bad efficiency wise. The P4 of course was known for running hot, and hence also using lots of power. My older brother donated a MSI socket 478 mainboard to me some time ago without a CPU. I looked through my collection of CPUs and found a Celeron 2.4Ghz and heat sink. I installed it and 1Gbyte of DDR and it worked with little effort, but the power consumption without hard disks was about 80 something watts, not ideal. I decided to press on with this hardware as I had no other vintage parts that would be suitable, and that power usage ought to be the worst for the board and processor. That and I don’t have money for new hardware at the moment. So I assembled the machine in the chassis with a Pioneer DVD drive and two Western Digital hard drives. I selected two 80Gb ATA WD drives as they turned out to have the best power consumption and reasonable capacity. All together, just sitting at the BIOS screen the machine used about 100W. Again a worst case and not that great a saving, but at least it’s significantly faster. I decided to stick with NetBSD for this build for a few reasons, firstly it is simpler to migrate the configuration and data from the old machine. Secondly I like NetBSD because of how light it is and how easy it is to work with. I downloaded the latest version (6.1.4 as of this writing) and went through the install process. Installation was fairly easy, but I couldn’t get X to work correctly on my hardware. I didn’t have a local X server before, so I didn’t worry about getting it to work beyond XDMCP. After installation I measured the power consumption of the machine at idle, I was pleasantly surprised that it dropped to about 65-70 Watts, a nice improvement over the sparc. Power usage peaks at about 100W when the machine is under full load as I first thought. After setting up the hard disks to power down after idle for a while I managed to reduce this to just bellow 60W. I’m now happy with the hardware I have set up, although I could use modern hardware and save even more power. I’m currently in the process of setting up the software. I’m rebuilding the kernel and userland for NetBSD. It’s a surprisingly easy process, and well worth it especially for older hardware. I’m not ready to deploy the machine yet, but it looks like it will work well. Last weekend I tried a number of different operating systems on my Sunfire V440 in an attempt to get the Wildcat expert3D-lite frame buffer I have working. None of the systems I tried had any luck on the v440 and the one system that has official support for the wildcat – OpenBSD – would not install because of crashes during the process. I have another Sunfire machine which also needed a new operating system, this one a Sunfire 280R, so I transferred the frame buffer card into the 66Mhz slot in the 280R and began the OpenBSD install process. Like last time, I was not impressed with the installer. It is very simplistic at best, and not very noob friendly. Fortunately since I’ve installed the other BSD systems a few times I managed to work out how to get it set up. I’d say the least intuitive part would have to be setting up your hard disk partitions, this is done with a command-line utility that wasn’t very easy to use. At least this installer can be run from the machines console instead of over the serial line. So I booted the new installation up and was happy to see in the kernel messages that the frame buffer is indeed supported by the ifb kernel driver. So I set up xdm to start the X server and configured X with the wildcatfb driver. After rebooting I was greeted with a graphical login! I logged in and found a hideously out of date FVWM installed as the default window manager, time to install some software! I tried out installing some of the binary packages available, but found the package system a little bit clunky, so I downloaded the ports system for OpenBSD to build stuff from source. It’s often a good idea to build your packages from source with any of the BSD systems as you usually get better performance and can choose features in the software you want to use. Binaries are often compiled for the lowest common processor on the architecture you’ve installed, this makes them slower and they have only the default options enabled. I installed the latest FVWM from ports and various other bits of software. I found the ports system was fairly easy to use, but it doesn’t have as many packages available as the other BSDs. Many of the packages I installed were also older version than those found on other systems. It wasn’t until I tried to run some software, such as a web-browser, that I discovered something annoying about the support for the frame buffer. The supported pixel depth for the display is 7 bits per pixel! This was quite annoying and most software is looking for 8bpp at a minimum, and 7bpp has never really been used historically. I may be able to run the display on a lower depth (I haven’t tried this yet), but that probably won’t help for the vast majority of software. In the end I did manage to find and install some X software that works at 7bpp, but I don’t feel like I have a workable workstation. I couldn’t find all the bits of software I felt I wanted on the machine, and many in the ports collection wouldn’t run on the local X server. Given that OpenBSD isn’t really a desktop OS this is hardly surprising. I’ll be looking for a copy of Sun Solaris for this machine now, as that will have proper support for the frame buffer and I can use either pkgsrc (from NetBSD) or FreeBSD ports to install free software. 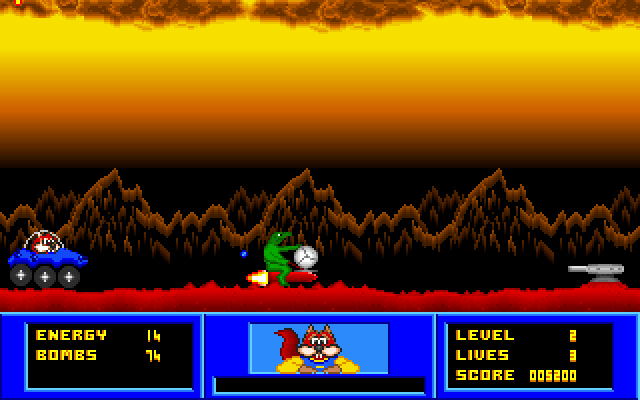 Skunny: Lost in Space is another game featuring Skunny the Squirrel and was made and published by Copysoft back in 1993. I vaguely remember playing this game for a very limited amount of time, and I played Back to the Forest earlier this year, so I didn’t have high expectations today. 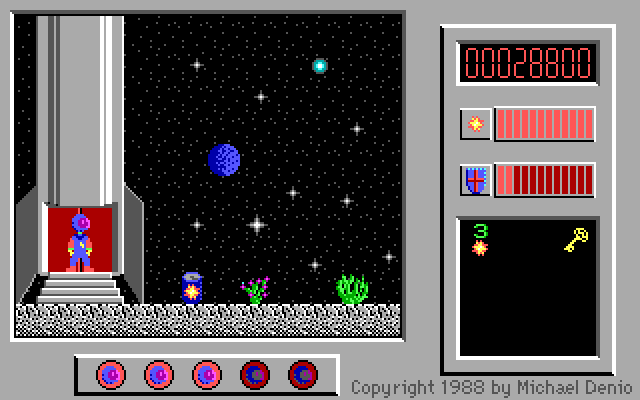 Lost in Space is based on an arcade game called Moon Patrol, a classic Williams game that was ported to many systems in the early 80’s. Once again the graphics are in VGA and support parallax scrolling. It seems many assets from earlier games have been reused where possible, so the artwork is similar quality. The animations are however better, as they seem to have more frames of animation and are smoother. The graphics performance is also better as it appears to run much better on the equivalent of a 386sx in Dosbox fine. Sound comes in the form of PC Speaker, Sound Blaster and Adlib support. I couldn’t run the game with Sound Blaster support under Dosbox as it locked up the game, but given previous experience that may not be a bad thing. The PC speaker noises were fairly simple, but they were a bit annoying although not really bad. The game has Adlib music that you hear only in game and was loud, very loud. It is a fairly simple tune that repeats over and over, so it’s probably best to turn it off as it gets annoying quickly. It is best to turn off everything except the PC speaker sound (it as well if you don’t like it) otherwise your ears will bleed. 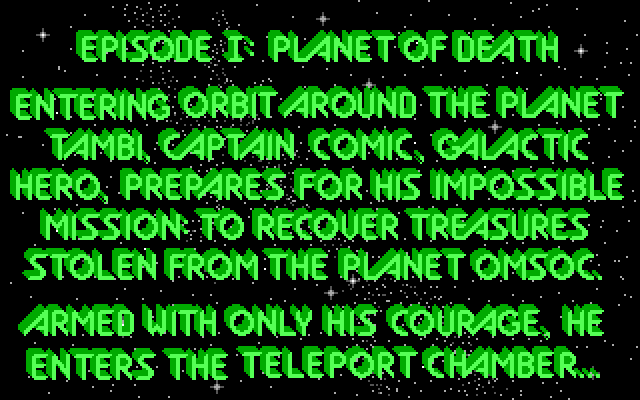 The game-play of these older DOS games is usually their redeeming feature that makes them worth returning to, no so with Lost in Space. It is brutally difficult, and not in a good way. Enemies have longer range guns than you, making it near impossible to avoid taking damage. You have a limited amount of ammunition which can leave you vulnerable when you run out. You can fortunately pickup more ammunition and health, but these are uncommon and spaced too far apart. The controls also contribute to the difficulty. Moving around isn’t so bad, but it is quite difficult to jump over the various holes in the terrain. At first I thought the height of the jump was almost random, but I worked out that to jump over the larger holes you need to be moving faster. This can be achieved by moving towards the right until you speed up, the downside being you need quite some space to achieve this longer jump. This makes it quite difficult to jump a large hole that you didn’t know about or didn’t have space to prepare for. The difficulty is very punishing as you have to start the level from the beginning every time, unlike the arcade game which had many checkpoints along the way. You can go through your three lives very quickly and there is no option to continue from where you left off. This results in playing the same segments repeatedly for a long time. I only attempted the first two levels as they were too difficult to beat in the short time frame I had this week. I suspect the reason I didn’t play this much was because of the difficulty, and it seems to have deterred many other players not only from this game, but other Skunny titles.